More guest post goodness from Kyle McLea! Check Part 1 here. Crayfish are quite tractable for neuro experiments, including nervous system organization and function, and have been useful in many past experiments. Importantly, as a crustacean biologist, I can also see how they’d be useful models for other, larger, more “economically important” decapod crustaceans like lobsters and crabs, for which rearing is very difficult or impossible with current techniques. Although Marmorkrebs have a fairly long generation time and only a “primitive” crustacean has had its genome sequenced, marbled crayfish are easily kept and reared and have a number of other reasons in their favor as a useful model organism. Now, I don’t want to tread where others have already walked. Important in the “What can we use the Marmorkrebs to study?” literature is Günter Vogt’s 2008 article in the Journal of Zoology. Vogt discusses many reasons why Marmorkrebs are of use to a scientist—they are easily grown and cared for, they “breed” all year round, all life stages are accessible for examination, and more. They have large eggs found outside the body that are excellent for those studying development from the embryonic stage to adulthood. He goes on to make the case that marbled crayfish will be useful for developmental biology, stem cell research, and studies of regeneration. In addition, because the animals are genetically identical, epigenetics and epigenomics may be a powerful niche where these clone crayfish can prove their utility. Epigenetics is the study of variation that is not dependent on the DNA sequence of an organism—and in epigenetics we see marks of diet, aging, and other happenstances of life stamped “upon” the DNA but not actually changing its sequence. The definition of an epigenetic effect is seeing differences in some phenotype (outward appearance of a trait) in an organism among isogenic (genetically-identical) animals. For epigenetics, which will be enormous in 21st century biology, a genetically identical crayfish may be just what we need. Vogt also goes on to recommend marbled crayfish for studies of evolution and for toxicology studies. I’m going to talk about the latter before moving on to some other reasons to be excited about these incredible crayfish. Crayfish have long been lauded as “sentinel species” for monitoring environmental quality. A number of parameters of crayfish physiology are helpful to scientists studying pollution, including how these animals survive, what metals or contaminants they accumulate in their tissues, and more. So, Marmorkrebs can certainly serve just as well as other crayfish. But in fact, their genetic identity is of further use in toxicology studies. Smaller numbers of animals in a given strain are needed for testing if they are all genetically identical and react similarly to a drug or toxin. And although it seems counter-intuitive, testing a few different strains or lines within a species may demonstrate greater total genetic variance than looking at a single outbred strain of animals in greater numbers. So in the end, we can maintain large numbers of the small marbled crayfish for toxicology studies, minutely manipulate their environment by introducing drugs or environmental chemicals, and perhaps get a better read out on toxicities and safety than we might even get from rodents. Now, I think a lot more studies are really needed before we could actually demonstrate that, but it is a potential use. And these animals would surely be better models for toxicology of invertebrates regardless. 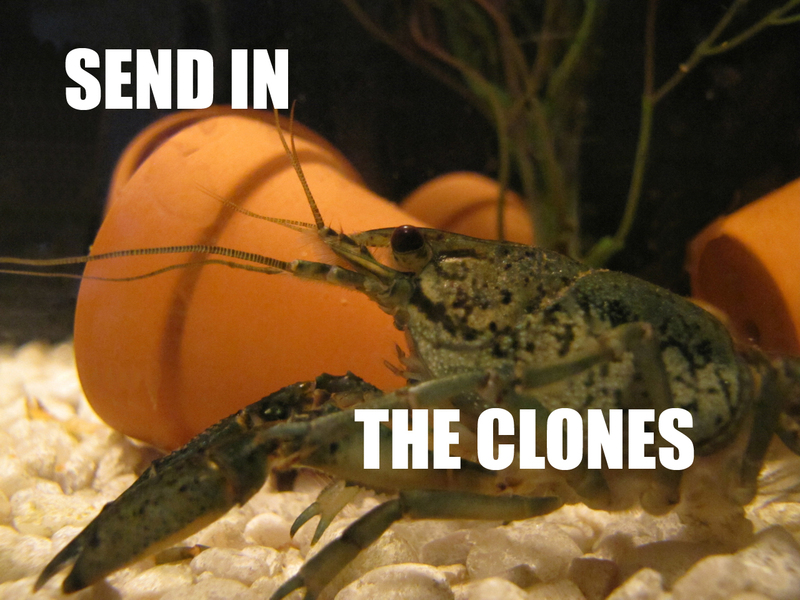 Finally, I also think these clone crayfish will make a great model organism for genetic studies. We don’t have many macroscopic (visible without microscopy), multicellular organisms that are both isogenic and easily genetically manipulable. (That is, can we introduce new genes? Can we change the ones that are there?) Marmorkrebs could fill that need. Now, we have a long way to go, since cell culture is currently problematic for crustaceans, we have had only limited success manipulating gene expression in crustaceans, and less success has been had in developing transgenic decapod crustaceans. But once some of these problems have been addressed, I think the scientific community may be more willing to accept Marmorkrebs as a useful genetic tool in the study of invertebrate genetics. Which brings me to the ultimate point of this entire article, for those who are still reading. I have a project that is a small step in the study of marbled crayfish and their genetics. 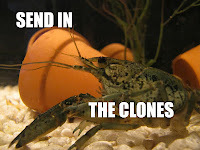 In collaboration with Doctor Zen, I’m raising money (through the #SciFund Challenge) to study the genes of Marmorkrebs and get a lot more information about their organization and the similarity between lines descended from different crayfish mothers. How genetically identical are they? What differences do we see between lines? How about if we compare them with the sexual version of Marmorkrebs, Procambarus fallax? (Which I haven’t mentioned, but is another whole neat aspect of the Marmorkrebs story!) There is so much to learn. But if you’ve read this far and are interested to help us learn more, consider funding this project with a $1 or $5 donation here. Or if you can’t donate, consider spreading the word to your friends and social networks. Thanks, and remember: Never send a sibling (or some outbred critter) to do a clone’s job. That’s what we have Marmorkrebs for. Kyle, scientist at Colorado State University and science blogger at By Way of Science.